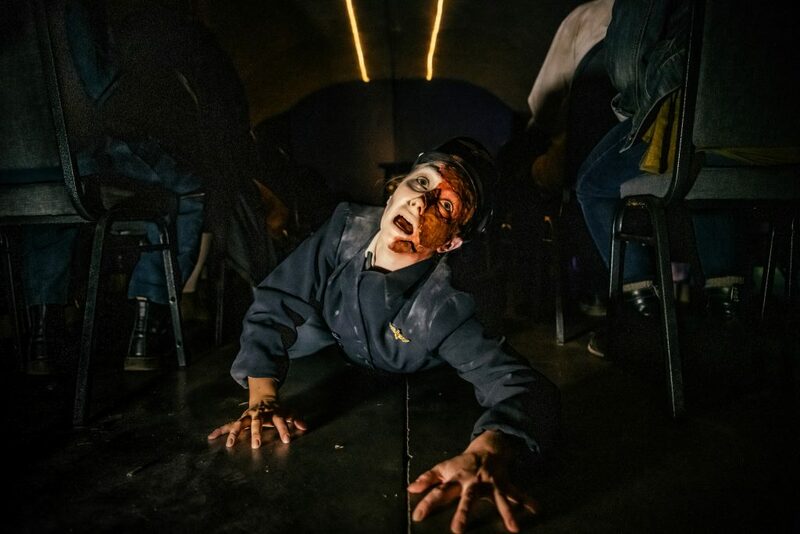 What started as a one night only, pop up production staged in a bar on Halloween has grown into a shambling beast of a spectacle. Celebrating 11 years of local horror, Dead Centre of Town continues to evolve beyond our wildest imaginings. This beast is bigger than us, and we’re so proud of the monster we created. 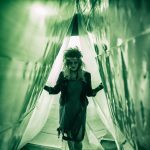 Each year, we haunt a new location, exhume new true local stories, and bring the scares to life through an immersive theatrical experience. 2018 marked the biggest and most challenging year for our team yet. 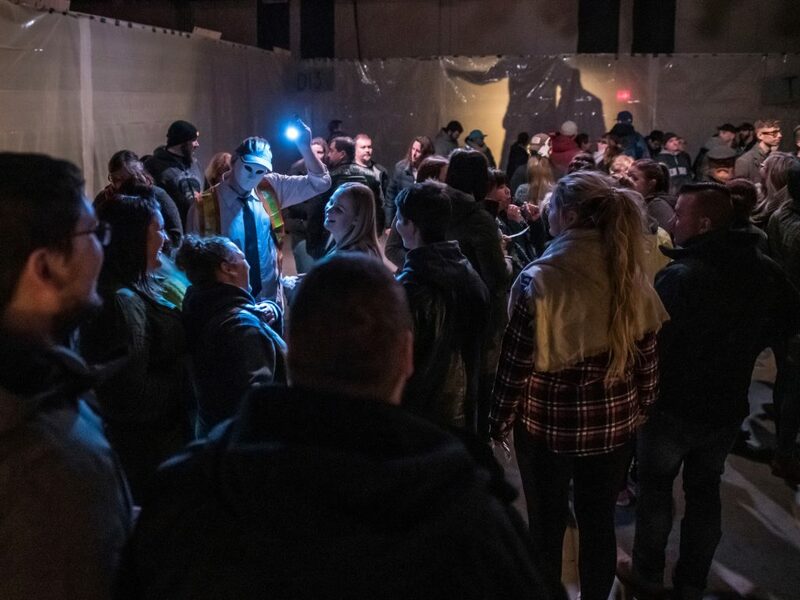 Though the Blatchford Field Air Hangar proved a difficult space to tame, we welcomed more audience than ever before through the security doors, who immersed themselves in the atmospheric retelling of some of Edmonton’s greatest aviation disasters. To the audience who joined us in the park after dark: thank you. For taking a risk on live theatre. For an insatiable interest in Edmonton’s history. For celebrating the Halloween season with us. To our cast and crew who dedicated countless hours, passion, and sometimes even blood, sweat and tears: thank you. For breathing life into Edmonton’s dark and sordid past. 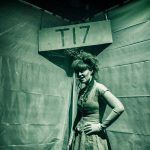 For putting on one hell of a show despite the sometimes daunting conditions of immersive, site specific theatre. For your scarily impressive talent. To our volunteers, who braved the weather and the crowds to help make this experience exceptional: thank you. For supporting your local weirdos. For bringing your own passion and energy to this mammoth production. 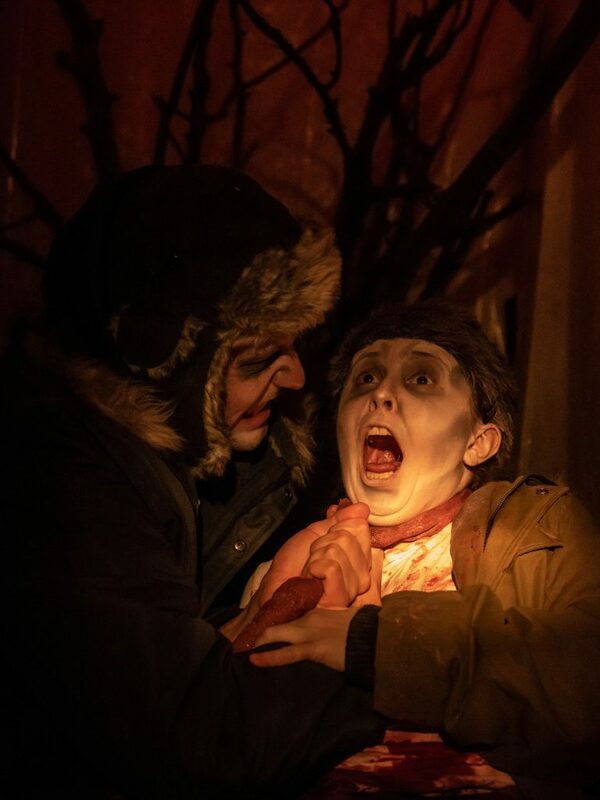 To our partners in scares, Fort Edmonton Park: thank you. For providing the most epic location and the freedom to create. To our funders, the Edmonton Arts Council: Thank you. 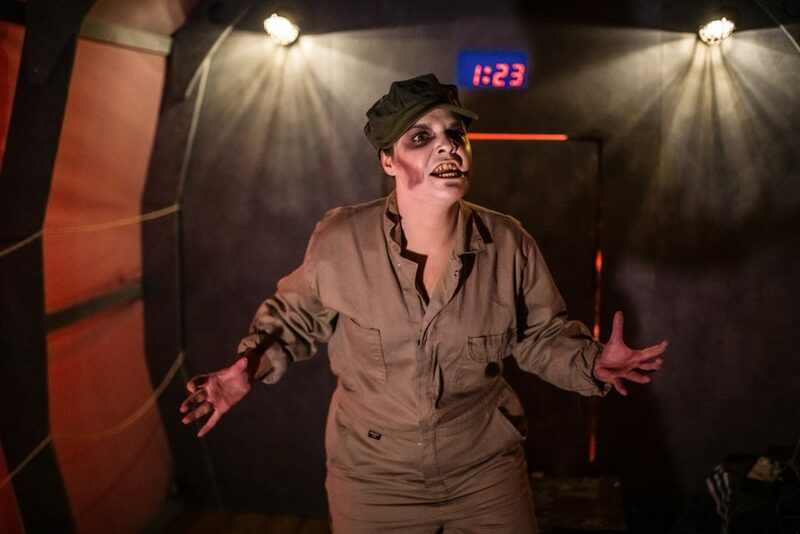 For supporting experimental theatre and the unconventional retelling of local history. We’ve come a long way in 11 years, and we’re already scheming for the next 11 to come. 2018 marks the 11th annual Dead Centre of Town. Dead Centre of Town XI took place in the Blatchford Field Air Hangar in Fort Edmonton Park, and reimagined some of Edmonton’s greatest aviation disasters between the years of 1929 and 1985. Below is a brief synopsis of the stories told this year. Flight 3801 left Toronto en route to Edmonton with five crew and 86 live cattle. First Officer Lowell Doerkson had just been promoted to Boeing 707 operations, but blowing snow and low visibility made landing exceptionally difficult. With added factors of fatigue, turbulent air, and a heavily loaded aircraft, the approach became too difficult for the young pilot. At some point during the descent, experienced Captain Arthur Jung attempted to take control of the flight, and arrest the sink rate. But it was too late. The plane clipped a bluff of poplar trees more than 3,000 meters short of the runway before striking the ground at a glancing blow. The tail fin caught live power lines, and the fuselage broke away, sending all 86 heifers 100 meters through the windshield. The plane eventually landed in the middle of a gravel pit, and burst into flames. City of Leduc staff were still discovering pieces of debris near the crash site just last year. Albert Johnson, also known as the Mad Trapper of Rat River, shot and wounded a police officer who had executed a warrant against him for illegal trapping. This sparked a long and arduous chase through the northern wilderness, during which Johnson repeatedly evaded RCMP. In February 1932, RCMP commissioned Wilfred Reid “Wop” May to fly over the area in an attempt to track Johnson. May successfully scouted Johnson after discovering a set of footprints leading away from caribou tracks in the middle of a frozen river. Thanks to May’s keen eye, RCMP cornered and killed Johnson, bringing the case to a close. A military issued Douglas C-49K assigned to Headquarters Squadron of the Air Transport Command’s Alaska Wing at Edmonton was assigned an administrative flight along the Northwest Staging Route in February, 1943. Carrying three crew members, eight passengers, unidentified cargo, and sacks of mail, the service mission ran from Whitehorse to Edmonton with four scheduled stops along the way in Watson Lake, Fort Nelson, Fort St. John and Grand Prairie. The plane successfully made its first two scheduled stops in Watson Lake and Fort Nelson, but en route to Fort St. John the plane simply disappeared. No distress calls, no position reports, no transmissions or communications or any kind were received from or sent to the plane. The plane simply never arrived. It was reported missing by the military two hours after it had been scheduled to arrive in Fort St. John. All assets of the Air Transport Command’s northwest region were involved in the search to find the missing plan over the next four months, though the plane was never recovered. Five years later, a hunter and his guide tripped upon the crash site, discovering human remains and scattered mail dated February 5, 1943. The military was immediately called in to investigate. That same day, the Edmonton Journal reported the plane had been carrying $200,000 in currency, and 400 pounds in gold. A second story reported $500,000 in currency, and a third reported $1Million. No evidence of the cargo was ever reported, and the military never confirmed nor denied what was aboard the plane, and a crash report was never filed, so no evidence of how the plane went down was ever made public. Two Hercules transport planes collide in the only mid-air collision 1,000 feet above the Canadian Forces Base right here in Edmonton. One plane crashes into a wooden shed. The second plane hits ground between two full fuel storage tanks. Both planes burst into flames. Ten lives got on those planes that night, and ten lives were lost in the crash. A dark day in Edmonton’s history. New Year’s, 1929. A case of Diphtheria broke out in Fort Vermillion. A quick moving toxin, the local doctor sent word to Edmonton for help before the whole town’s infected. Local aviation heavyweight Wilfred Reid “Wop” May agrees to fly a mercy mission to deliver the antitoxin. Though Wop’s plane wasn’t meant to fly in winter weather, he takes to the sky in an attempt to outrun death. He keeps the serum safe inside a charcoal heater wrapped in a blanket, but the blanket bursts into flames forcing him to land unexpectedly. In an effort to save the serum, Wop and his copilot Vic Horner keep the serum warm by shoving it in their armpits and down their pants. The eventually land in Fort Vermillion, successfully delivering the serum in time. German-Canadian Marten Hartwell crashed his Beechcraft Model 18 into the hills of Great Bear Lake with English nurse Judy Hill, Neemee Nulliayuk, a pregnant Inuit woman, and David Kootook, a 14 year old Inuit boy suffering from appendicitis on board. Nurse Hill died on impact. Nulliayuk died later that night of a broken back. Hartwell suffered a broken knee, two broken ankles, and a blow to the head. Kootook, relatively unharmed, built a lean-to, kept the fire going, and divvied up the rations. When the rations ran out, the two survived on lichen, tree bark, and snow. Hartwell knew he didn’t have much choice but to cannibalize the bodies littered around the crash site. When “starvation madness” finally got the better of him, he chose Nurse Hill, cutting into her thigh. He kept bits of her inside the rations box for safekeeping. Kootook was awarded a Meritorious Service Cross posthumously. The Inukshuk overlooking Edmonton’s river valley next to the Shaw Centre is an homage to the boy’s bravery and selflessness. 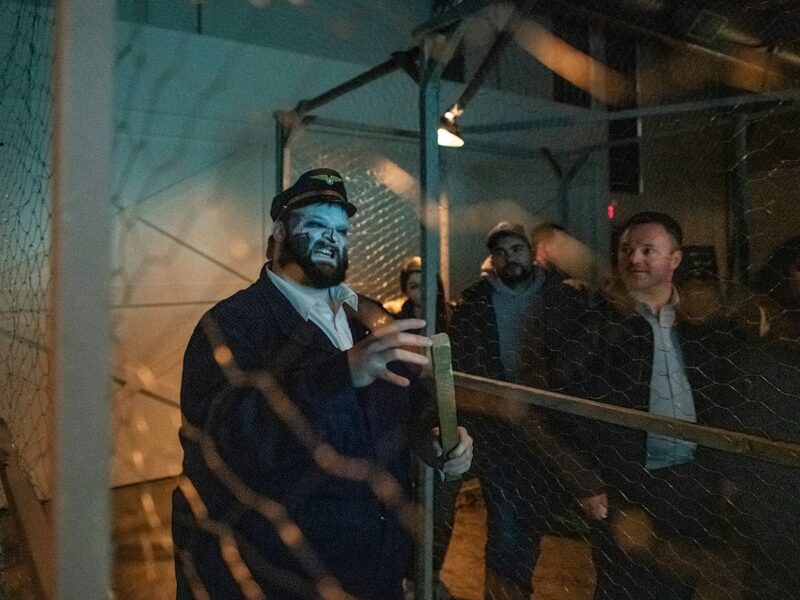 We’ve loving dubbed our ghastly guides “Henches.” These skilled performers are responsible for ensuring the audience’s safety, while keeping the intricate mechanics of the show on track. Dead Centre of Town has evolved from an enclosed, one-room performance, to a roving, rotating, immersive Rube Golberg live theatre machine. Our Henches are an invaluable part of the creation process and the audience experience. 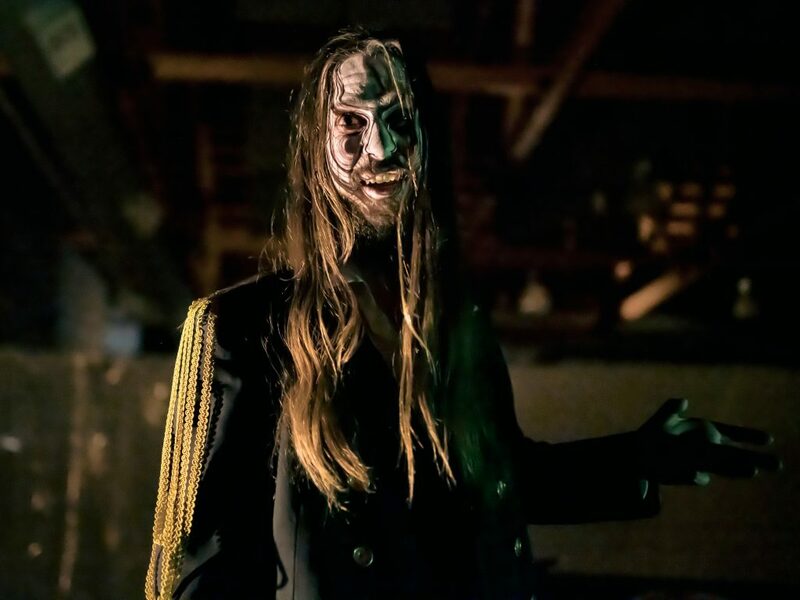 Channeling the Crypt Keepers and Vincent Prices of yore, Dead Centre of Town host, Wilf, has become the iconic face (and spine-tingling voice) of Edmonton’s Halloween season. Expertly played by actor, poet, and improvisor Colin Matty, Wilf is the exhumer of local lore and keeper of audience fates. They’re the scare masters, impossible machine wizards, and technical geniuses who bring the world of Dead Centre of Town to life. These talented masterminds offer a broad cross-section of specialized skill and talent to this production year after year. It took a running crew of six to keep the magic on track this year, and though you may have seen their shadows lurking behind you, you may not have realized they were the magicians behind the dark magic. We are incredibly grateful to the people and organizations who help bring this beast of a show to life. Dead Centre of Town could not happen without the generous support of these folks listed below. Thank you for believing in us! Aaron Harrity, Cliff Kelly, Jenna de Vries, Lech Lesiak, Adrian MacKenzie, Adam Mitchell, Chris Kavanagh, Fringe Theatre, L’Uni Theatre, Chris W. Cook, Paul Blinov, Matt Schuurman, Mary & Tim Schuurman, Alice Schuurdart, Marc Chalifoux, Ian Jackson, Teresa Ryan, Mark Hill, Joe & May Carter, Louise Mallory, Gary, Fort Edmonton Park staff and volunteers, and the generous support of the Edmonton Arts Council. 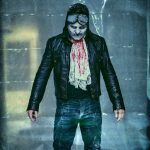 Dead Centre of Town is Edmonton’s only live action horror show inspired by true history. As most great ideas do, it began as a harebrained conversation over a glass of wine. Across the street from the downtown apartment the Dart Sisters shared in 2007 sat The Globe Bar and Tap House: a mysteriously gothic building that stuck out like a sore thumb amidst the then low slung skyline of Edmonton’s concrete core. With a passion for local history, a curiosity for creating in unexpected spaces, and a budget of just $500, we produced the first iteration of Dead Centre of Town at The Globe. 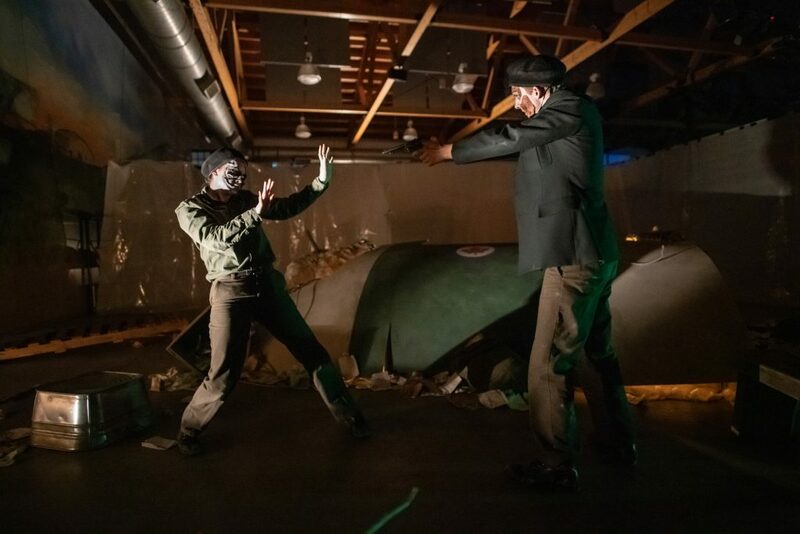 Inspired by the true history, lore, and urban myths of the building and surrounding area, this one-night-only production played to a sold out audience of 150 patrons. The success of that night had us hooked. 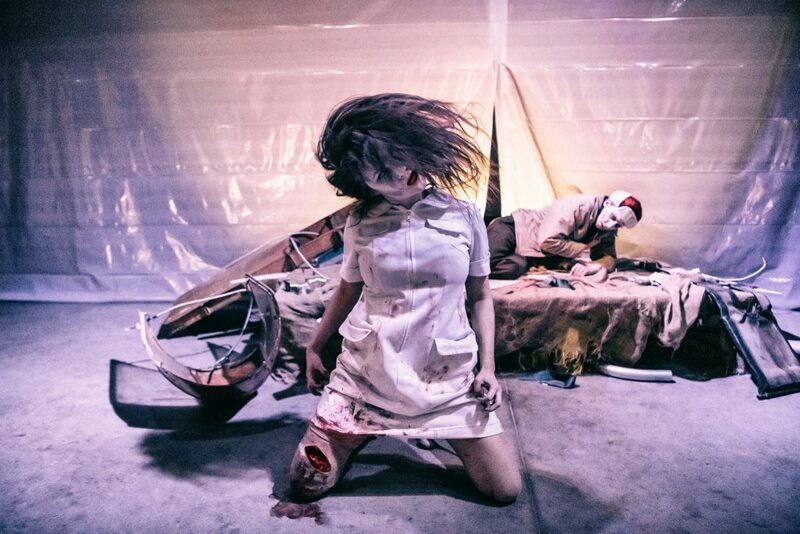 Since 2007, we have created and produced ten iterations of Dead Centre of Town. 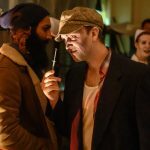 Each year, a new script, a new location, new scares, and a new look into Edmonton’s rich, though sometimes sordid, history. The upper floors of Block 1912 (2013), housed in the Hulbert Block, constructed during the economic boom before World War I in the Strathcona commercial district. The Batchford Field Air Hangar at Fort Edmonton Park (2018), originally constructed in 1929, and home to Edmonton’s first air harbour. The growing success of Dead Centre of Town is undeniably due to its committed and passionate company members, and our amazing audience! 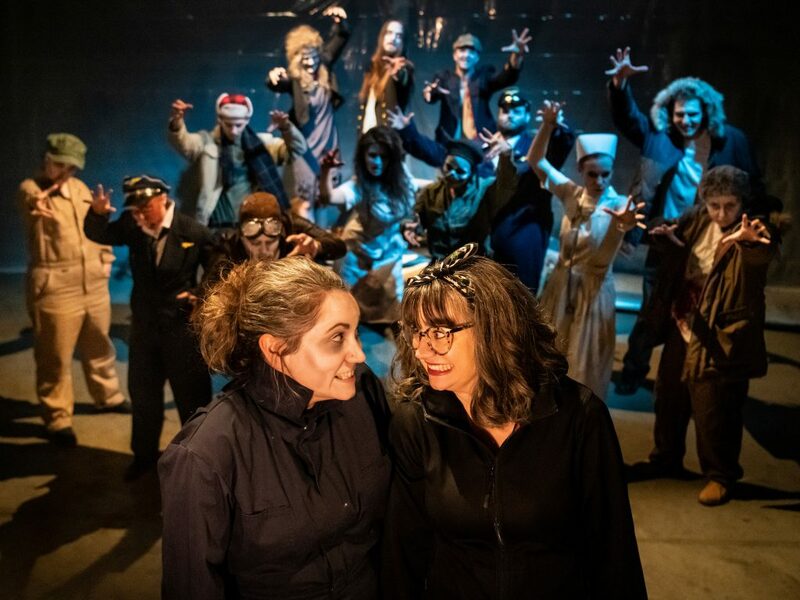 Over the course of 11 years, we’ve had actors, designers, technicians, and even audience members return year over year, some of whom have been with us since the very beginning. To call it a passion project would be a gross understatement – our collective is fiercely dedicated to this project, and each bring a wealth of skill and knowledge, a passion for local history, and untameable energy to the production each year.